…to attract new customers, encourage loyalty of local shoppers and support Cochrane’s economy and the community in general. Your business can accept Cochrane Dollars just by letting us know! There are no start-up costs, and we’ll support you every step of the way with a fantastic marketing program. Anytime you need to purchase Cochrane Dollars or want to exchange them for Canadian dollars, just go to ATB’s Cochrane branch. Ready to accept Cochrane Dollars? Add your business to the directory! 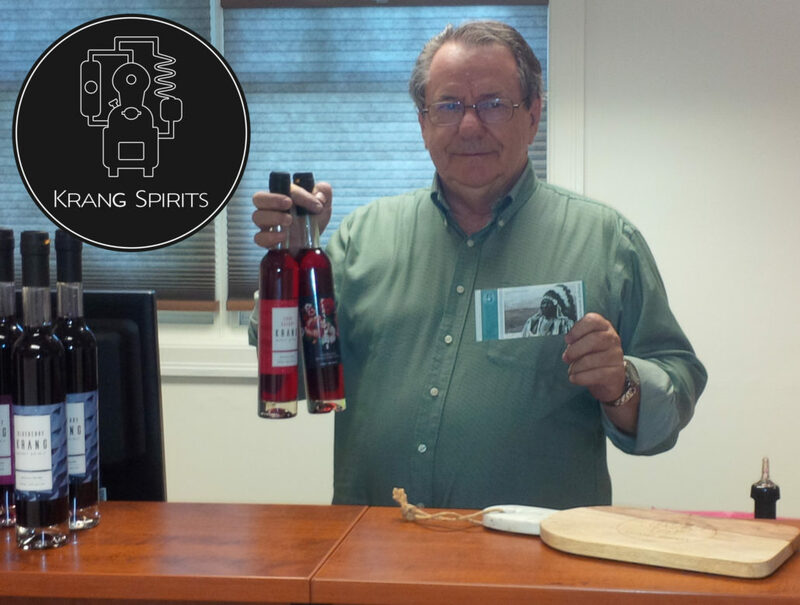 Michael Guenzel of Krang Spirits shows off two bottles of their liqueurs that will earn customers 5C$ when purchased. Since the launch of the Cochrane Dollars into circulation in May of 2017, Krang Spirits has been offering their customers 1C$ cash back on the purchase of a single bottle of their spirits and 5C$ back with the purchase of two bottles or more. They can say with confidence that they almost never make a sale of a single bottle of their vodka or liqueurs and it appears that this promotion is working as intended. They can’t compare sales to the previous year as the distillery hasn’t been open that long. “Customers like that they can spend the Cochrane Dollars in other businesses in town”, say Susan Ransom and Michael Guenzel, owners of Krang Spirits. “Once we tell our customers that it’s like Canadian Tire money but not limited to our store alone, they understand the project completely”. Susan also says that not a single customer has turned down the offer of free local money and a number of tourists say they want to take them home to show family and friends. This means they will talk about the business in Cochrane they received them at and we can expect at least some of those conversations to translate into future sales as tourists and their family or friends return to Cochrane. Krang Spirits’ customers also say they love the idea that the Canadian dollars held in the bank for the Cochrane Dollars can never be spent but the interest gained from them can be used for community projects. For Susan and Michael at Krang Spirits, the fact that there are no costs involved for the consumer or business owner to use the Cochrane Dollars as a promotional tool makes all the difference. “If there were fees, restrictions or other rules involved, we wouldn’t have participated”. Cochrane Dollars can be purchased using Canadian dollars (cash or ATB debit card only) at a 1:1 ratio from May 19, 2017 at ATB Financial, Cochrane branch only – the central bank for Cochrane Dollars. Cochrane Dollars stand in for Canadian dollars, just as gift certificates. Cochrane Dollars will encourage more of the 1.4 million consumers and tourists in the Cochrane area to choose Cochrane as their preferred location for retail shopping. 100,000 Cochrane Dollar bills are being printed! With your help, we’ll put as many Cochrane Dollars as we can into circulation; those bills will return to Cochrane businesses and pull Canadian dollars with them. 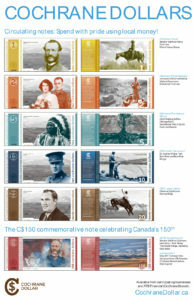 Residents and other local business people will use Cochrane Dollars like Canadian dollars. Community groups, organizations and others will be putting the bills into circulation as gifts to volunteers, prizes in contests, promotional items and more. Businesses will put Cochrane Dollars into circulation by giving them as cash back on purchases instead of offering a discount. This costs business owners nothing and it practically guarantees a second sale, as the Cochrane Dollars will return at a later date. There are no fees to business owners or consumers to use Cochrane Dollars. Give Cochrane Dollars as cash back or a bonus on large purchases. Give Cochrane Dollars as cash back or a bonus on items that would otherwise be on sale. This costs you no more than a sale price would. Offer them to customers in their change. Please note, a customer can only be offered them in their change. Give them to staff as an incentive. Give them as prize money. 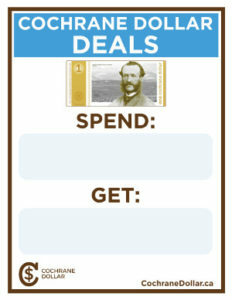 Use them to locally purchase supplies for your business. If you accumulate more Cochrane Dollars than you can recirculate, you can return Cochrane Dollars to ATB Financial for the equivalent in Canadian dollars. No fees are charged for this transaction.